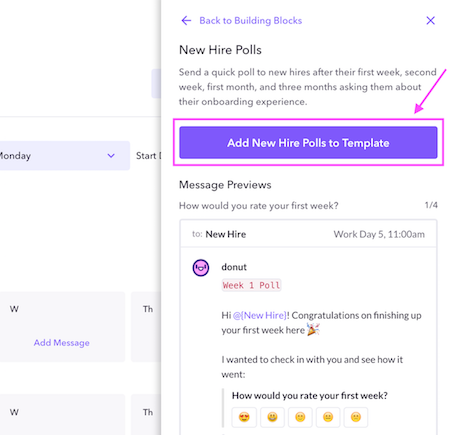 Building Blocks are sets of ready-made messages that you can quickly add to your onboarding templates. Whether you're just getting started with your first template or looking for ideas to make existing content more robust, Donut's Building Blocks make it easier than ever to discover and add new messages to your templates. Building block messages have been pre-sorted into a few different categories. 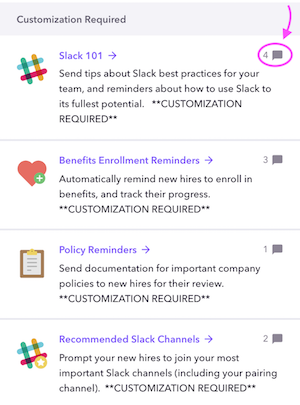 Customization required: includes messages that will require a bit of tweaking to fit your organization's needs, such as benefits, policy reminders, recommended Slack channels, etc. For Managers: includes messages and reminders for managers such as monthly check-ins, ramp-up polls to assess how new hires are doing, new manager onboarding, and more. In the top right corner of the screen, you'll see the purple building blocks button. Building Blocks contain one or more pre-written messages, and you can choose to add all or just a few to your templates. From the main view of the Building Blocks sidebar, you can see how many messages are included in each set. Click on the Building Block you'd like to use to review all of the messages that are included (you can scroll down within the sidebar to read the messages as they will appear in your template). 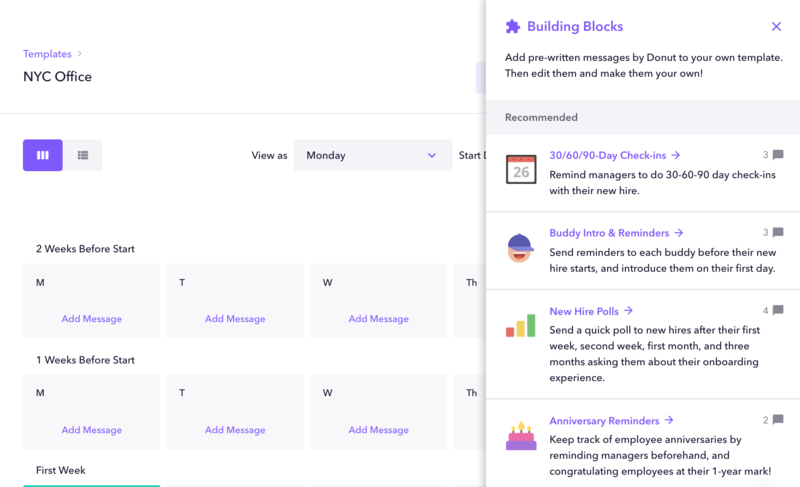 If you'd like to use all messages in a Building Block, hit the purple "Add" button, and all of the messages will be automatically added to your template. You'll be able to view, edit, and customize the text of new messages after adding them to a template. If you'd like to use only specific messages in a Building Block rather than all, you can drag and drop individual messages from the sidebar into your template. You'll be able to view, edit, and customize the text of new messages after adding them to a template. With Donut Building Blocks, you can quickly set up a brand new template, or use the pre-written messages as inspiration for your own ideas. Questions or thoughts? Open the purple intercom button in the bottom right corner to chat with us.